Science has never been my favourite subject in school. In fact, I dreaded it most of the time. Give me algebra, statistics and geometry questions and my face lights up. Tell me about magnetic fields, molecules and Newton's laws of motion, I get the shudders. That probably explains why I was the only one who dropped Chemistry and instead took up Further Maths back in junior college. When Angel's school teacher informed me that they hold Science enrichment classes every fortnightly and she has been introduced to concepts like sounds and light, I knew it was time to revisit this least well-liked but nonetheless crucial field of knowledge. Yes Angel, Mummy is going to enter the world of science, again, but with you this time round. I know, I just know, we are going to have lots of fun. For now at least, before you come and bug me with science problems and make me realise that I can't solve a single one of them. 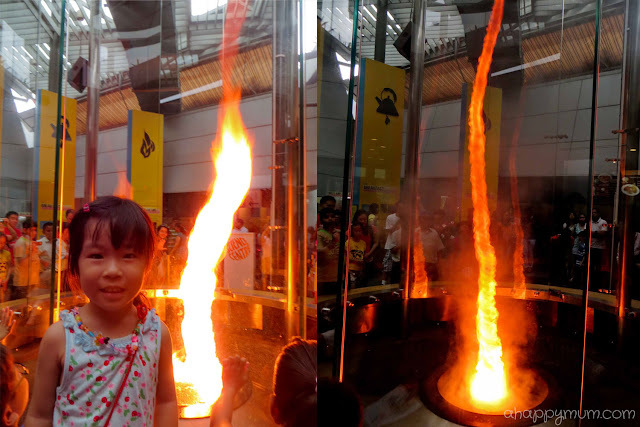 Last week, we made a trip to Parkway Parade and participated in a fun-filled biannual event - Science in the Mall. This year's theme was X-ploring the World of Energy which showcases several interesting aspects of science related to energy. Do these forms of energy ring a bell? Gravitational potential energy, kinetic energy, electric energy, chemical energy, sound energy, elastic potential energy, mechanical energy. Seriously, they had long been erased from my mind and it was through this event that these pieces of memories came floating back together. Through interactive exhibits like the swinging pendulums, merry-go-round and basketball hoops, kids were able to learn about the principles of energy in an entertaining way. However, as this event was targeted at kids aged 5-12, it was not realistic to expect Angel to understand scientific reasoning using GPE and trajectories. Nonetheless, it was a start for her to realise how science governs the world we live in. What I like about the event was the chance for children to create a customised 'toy' at the hands-on workshops, including a swinging gorilla, paper catapult and magnetic pendulum. They had to do this from scratch and even though Angel needed the expertise of the staff to help her out, at the end of the day it was an enjoyable science, and craft, session for her. There was also a science show which involved two men in black who explained all the different types of energy in a fun and informative way. Amazingly, thanks to the cute tiny robot, they managed to capture my girl's attention for that entire half an hour and it was to the extent that she refused to walk away even when the show ended. Her favourite part of the day had to be the Q&A session where she had the chance to show off her ball skills and answer a question on chemical energy. 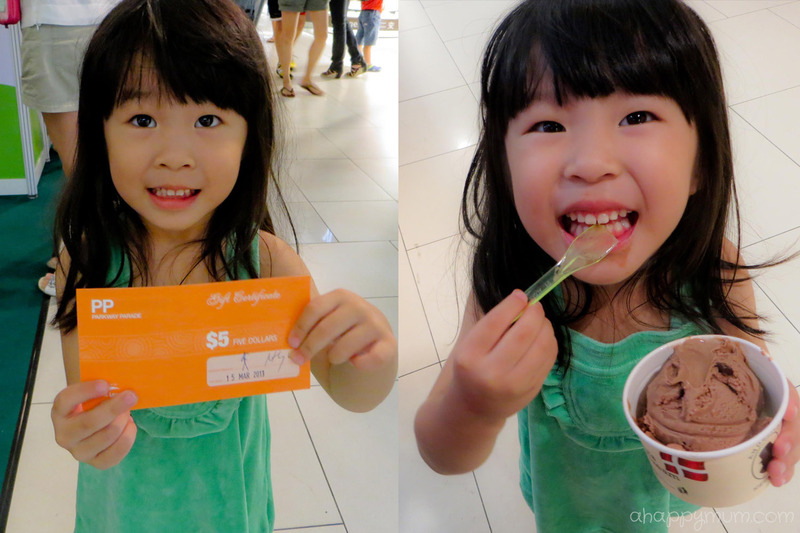 With a little help from daddy, she won a prize and walked off proudly with a $5 voucher in hand. Guess what she chose to spend it on? Well, ice cream, of course! Ok, it seems like I'm a little less apprehensive of science now while Angel is ready for more. What's next? Where would be a better place to continue our quest than to visit the leading centre in science and technology? 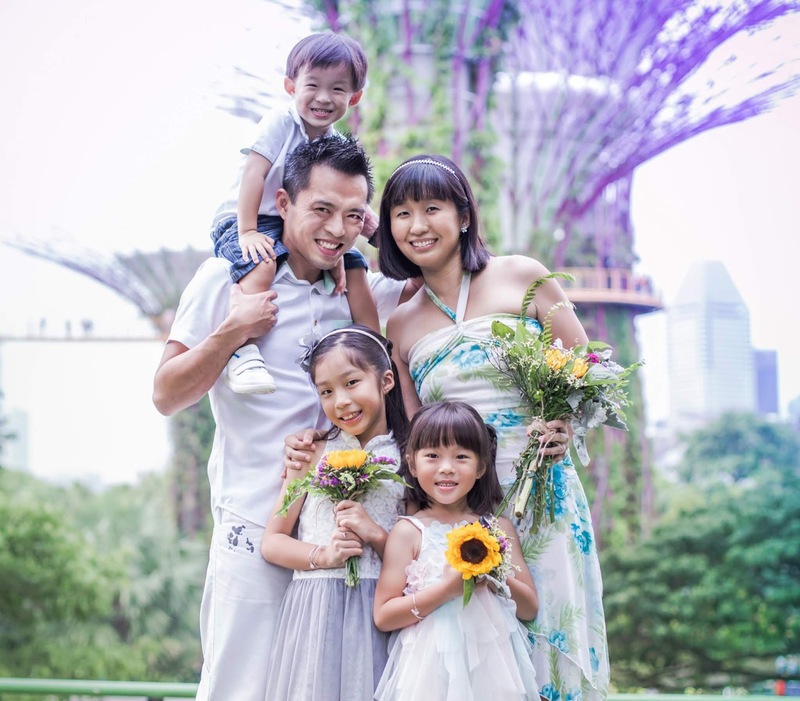 A first time experience for our family, we made a spontaneous decision to visit the Science Centre over the weekend. The dinosaur that always greets, or frightens, people at the entrance. Hello darling Ariel! You are probably too young for this but well, you have no choice but to follow us because we are a family! We were off to a great start for Angel seemed eager and excited about this visit. How did she look as a pirate in the magical mirror? 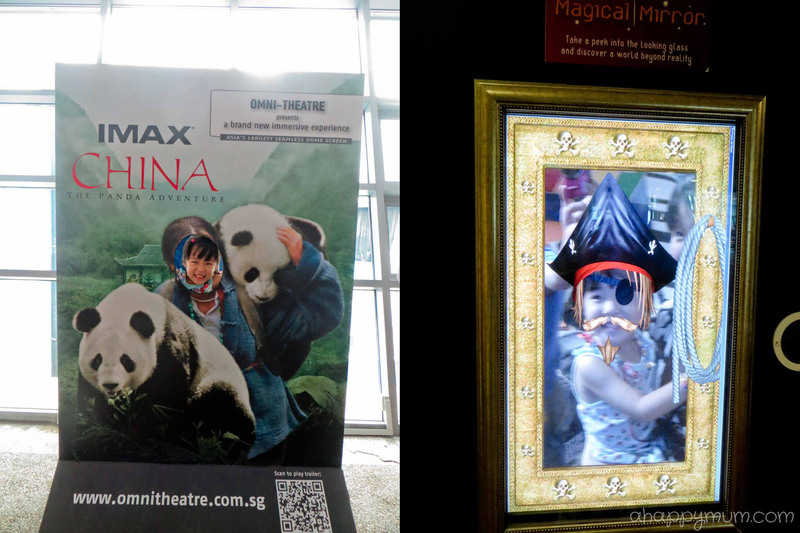 There was a long queue but she was willing to wait just to see herself in weird getups. 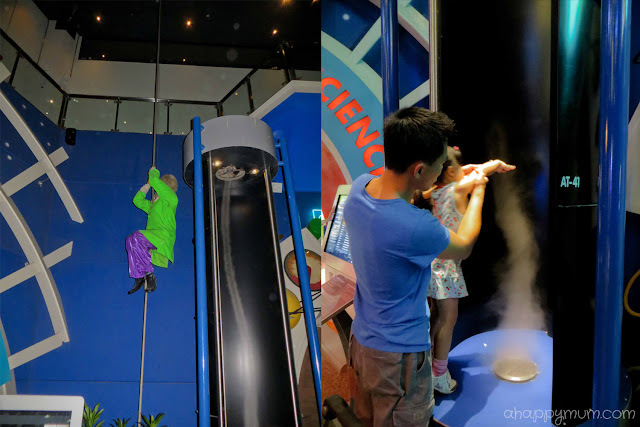 What I love about Science Centre is that it passes on scientific knowledge in a creative, inspiring and fun-filled manner. It is not only for kids, but people of all ages get to learn through play and it promises to be an engaging and enriching experience. Hello, how do you fancy me for dessert? You probably know that Angel is an avid zoo-goer so the fact that we found animals and insects inside the Science Centre made her ecstatic. Even if they included hedgehogs, turtles and eeew, hissing cockroaches. We watched the Fire Tornado show which aroused her curiosity and hopefully she now knows you need heat, fuel and oxygen in order for fire to occur. It felt great to just stroll around the centre and be able to see, hear and touch things here and there which sometimes give you a shock more than a surprise. The Climbing Einstein was one which frightened Angel and she stared at it for a few moments before her innocent stare turned into a scared one. Instantly, she tugged our shirts and yanked us into the opposite direction, saying "I don't want to go there". Well, it did take us some time to explain but she finally understood that Einstein was fake. One of our favourite games was the one where you had to listen to animal sounds and then guess which it was. There were only eight choices but believe it or not, we hardly got more than two correct despite trying at least twenty times. 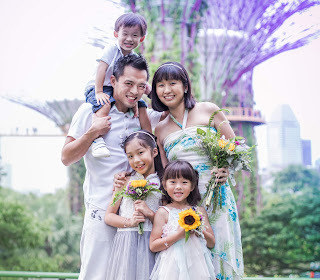 Dear Ariel, are you going to love fishes and marine life just like Daddy and jiejie when you grow up? The Balloon Science show was a hit with the kids, who couldn't seem to stop giggling every time a balloon popped. The hubby and I learnt something new too, like how you can poke a skewer through a balloon without it bursting by poking into the thick top and bottom ends so that air releases slowly. Or how you can make use of high and low pressure areas and use a hair dryer to keep a balloon floating in the air. I was so hoping to see a chick hatch out of an egg. But nope, luck wasn't on my side. Or that label was fake. We also took a walk in the Ecogarden and the most amazing find had to be this. Have you heard of the plant called the Mother-in-Law? Our final stop was the Waterworks where kids get to indulge in fun-filled water play. Angel's favourite part was picking up balls and then shooting them into the giant container. That marked the end of a brief but enjoyable time in Science Centre. We would have gone to Snow City too because we kind of miss the white winter but alas we did not have on our jackets and pants. So, we are leaving that to our next family excursion! For more information, visit the Science Centre website. Disclosure: The Science in the Mall event was attended due to an media invitation while we visited the Science Centre of our own accord. All opinions are my own. Impressive learning journey you have embarked into:)! You rock, Summer! Haha not impressive at all! So glad we met up that day finally and that the girls had fun learning and playing! It's called mother in law's tongue cos the tongue is sharp like MIL! I quite like our science centre. Poppy has been asking to go again cos the past 2 times we went,it rained so she didn't get to play in the water area! What a neat place! It looks like you had a lot of fun and learned a lot! Nice blog you have here on your learning experience at our Science in the Mall event and through your visit to the Science Centre. Would you be okay if we share your blog on our "Science It" Facebook page (https://www.facebook.com/ScienceIt)?